Managed by Banyan Tree, Deer Park Hotel is situated in the cultural triangle, emerging from the lush tropical jungle bordering and the banks of the Giritale reservoir. It is just a four hours' drive from Colombo. (10 miles before Polonnaruwa). The guest gets an overview of Giritale reservoir as soon as he enters the reception area. From exploring ancient civilisations in Polonnaruwa to seeing the endangered wildlife in their natural habitats, Deer Park Hotel would be ideal as you can stay with nature. The greenery surrounding Deer Park Hotel is home to an abundance of flora and fauna. The hotel features three types of facilities namely superior cottages, Duplex and Angsana. Superior Cottages are in the woods that are ideal for couples or families who wish to stay in connecting units beside each other. Duplex Cottages are the double-stories which are perfect for families and groups who prefer more privacy. Angsana Cottages are surrounded by beautiful landscaping and water lily ponds. The Angsana Cottage boasts its own private gazebo with views of the serene Giritale reservoir. Most cottages come with unique open-air garden bathrooms with outdoor showers so that the guests can enjoy the experience of a shower. The hotel is surrounded by a number of national wildlife parks. It is also close to many rural villages that engage guests in the discovery of local culture and practices. The hotel gives the guest a chance to experience treatment at the Angsana Spa or a romantic dining experience in one of their signature dining outlets. Angsana spa retreats are known to be sanctuaries for the inner self to refresh and rejuvenate a guest's body and spirit. Entrance to the spa has four lions sculpture which are mostly similar with Yapahuwa lions. (Which are depicted on the ten rupee note). This spa is managed by Singaporeans and they have both Sri Lankan and Singaporean therapists. Close to the Angsana Spa there is a shopping arcade which is called Angsana Gallery. Deer Park Hotel having twelve acres offers table tennis, volleyball, squash and billet to the guests for their entertainment. The hotel subscribes to the welfare (CSR) programme and many hotels undertake to develop the area and schools. "As a CRS projects we do many activities to the village welfare. We built a library and a ground for the schools and very recently we are going to open a new bridge," said General Manager of Deer Park Hotel Chandana Pathma Kumara. The main restaurant is called Ebony which is located near the swimming pool. Upstairs above the restaurant there is a conference hall which can accommodate 50 people. 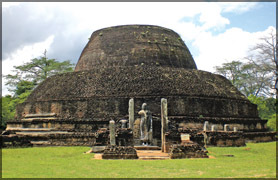 The Polonnaruwa ruins, Minneriya national park and Anganmedilla are close to the hotel. 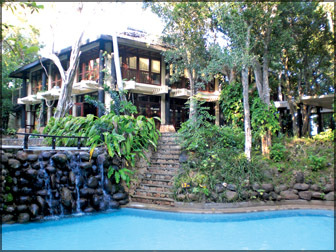 The cottages in Deer Park Hotel bring the guests right into the midst of nature. Set within peaceful jungle scenery and next door to the calm beauty of the Giritale reservoir, this is the perfect place to rest after an eventful day of cultural adventure or ecological trekking. In last week Daily News Travel we wrote that Sigiriya and Dambulla are interrelated. Likewise Anuradhapura and Polonnaruwa too are also interrelated names for all Sri Lankans and Foreigners too. Because of the cultural triangle Sri Lanka is more popular over the world. A distance of 216 km from Colombo and South East of Anuradhapura, the Polonnaruwa Kingdom was the kingdom from which Sri Lankan kings ruled the island from the 8th Century. After ruling the country for over 1200 years from the Anuradhapura Kingdom, Sri Lankan kings decided to move their capital to Polonnaruwa as it was further inland from Anuradhapura and therefore gave them more time to organise defences in times of foreign invasion. 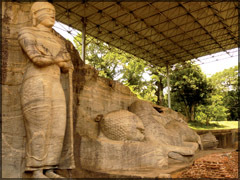 Some of the rulers of Polonnaruwa include Vijayabahu I and Parakramabahu I, (Parakramabahu the Great). Most of Polonnaruwa that remains today dates from after the 1150s, as the extensive civil wars that preceded Parakramabahu's rise to the throne devastated the city. 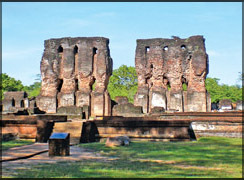 The Polonnaruwa Kingdom was abandoned in the 14th century, and the seat of government for the Sinhalese kings was moved to Yapahuwa. 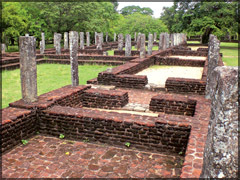 Although many factors contributed to this, the leading cause of the abandonment of Polonnaruwa as the kingdom of Sri Lanka was its susceptibility to invasions from south India. Today's ruins, however, belong almost exclusively to the reigns of these kings. The city itself, as well as the surrounding plain was watered by a unique irrigation complex known as the Sea of Parakrama (Parakrama Samudra) -so vast was its scale. "Not even a drop of water must flow into the ocean without being useful to man" declared the Great King Parakramabahu in the 12th century. 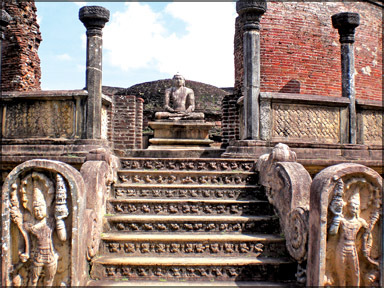 When we were reaching Polonnaruwa, the road along the banks of Parakrama Samudra takes the visitor to "the old city" area and many old buildings, sculptures and stupas. The first sight of the ruins , the Royal Palace of Parakramabahu (Parakramabahu Maligawa) is still impressive. 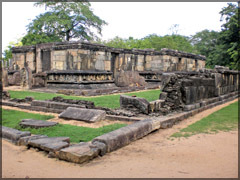 This is a seven storeyed palace named Vijayantha Prasada built by king Parakramabahu the Great (1153-1186 AD) in Polonnaruwa. 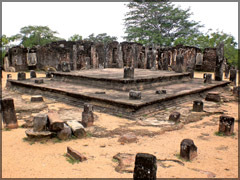 The basic ground plan of the palace is similar to that of the 12th century "Vijayabahu" palace at Anuradhapura the palaces at Panduwasnuwara and Yapahuwa. Remains of three stories are still to be identified. There is evidence that this place may have been destroyed by fire. Mahavamsa mentions that this had a thousand chambers. 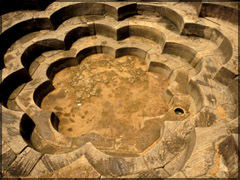 The royal bath now known as the Kumara Pokuna, must be the pond named Sila Pokkharani referred to in the Mahawamsa as built by king Parakramabahu. The pond elegantly built with a cruciform ground plan is designed in such manner as to get water from the adjacent water course and is also provided with outlets to drain off the used water. The pavilion near the pond must have served as a changing room. The ancient name and the builder of this Hindu shrine are not known. But according to the Archaeological Department sources this may have been built somewhere in the 13th century A.D. 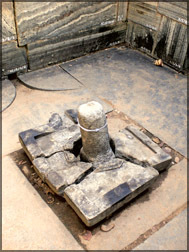 The main object of worship is the Shiva lingam in the inner sanctum. 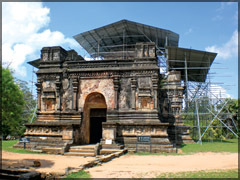 The Vatadage (round house) is one of the oldest monuments, (with some alterations by King Nissankamalla, Parakramabahu's nephew and successor) in Polonnaruwa and it is on the left as you enter the complex after climbing some steep granite stairs from the parking area. The Vatadage is a circular building designed with a dagoba on concentric terraces with sculptured railings, the largest with a diameter of 18 m.
The protective conical roof nor the dagoba that was the central core of the building are no longer there. This may have been originally used as the temple of the Tooth as there is mention of a relic house built by king Parakramabahu. Just as other vatadage in the island, this too appears as a round building enclosing a stupa at this centre. It has taken the present form probably as a result of the renovations. 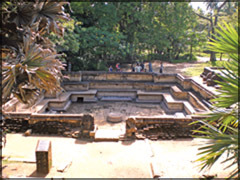 Reconstruction works done in the reign of king of Nissanakamalla or during the Dambadeniya period. The roof supported on stone pillars probably had wooden beams and covered with tiles. 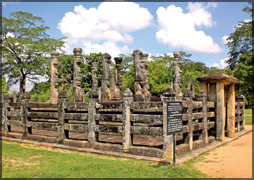 The moonstone and two guard stones to the north and east of the upper terrace respectively may be cited as the best examples of their kinds in Polonnaruwa. Hatadage because it was built within sixty (hata) hours. It has been a two storeyed building and the upper floor may have contained the sacred Tooth Relic. The roof may have had wooden beams and covered with clay. This is the only monument among these in Polonnaruva where the roof is well preserved. Structures of this type where the side walls and the roof are made of bricks without using wood are known as gedige. There are indications that there had been a giant seated Buddha image inside, but only the large seat now remains. This pillared structure could be identified on the Nissankalata Mandapaya. The unusual pillar type stimulates a lotus stalk with flower as the capital. In the centre is a small stone- cut stupa having truncated top perhaps received the relic casket during pirith chanting. This was probably covered with a roof. It is the giant inscription which assumes the shape of a palm- leaf manuscript in store has been a work of king Nissanakamalla (1187- 1196 A.D) and it is the largest stone inscription so far discovered. 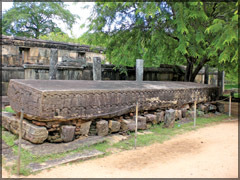 The inscription itself says that this large stone block was transported from Mihintale, some hundred kilometres from Polonnaruwa. Although known as Sathmahal Prasadaya, its ancient name and other facts of this edifice are not known. Built in the stepped pyramidal form, this seven storeyed structure may be a stupa of a rare kind. The architectural features common in South - East Asian countries are also visible in this building. 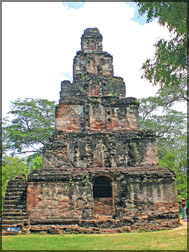 Located the South of the street which provides access to the ancient city of Polonnaruwa from the eastern gate it is popularly believed that this may be the stupa supposed to have been built by queen Rupawathi. The popular name Pabulu vehera may derive from the recovery of beads (pabalu) in the vicinity. One room has still a stone cut medicine trough (beheth oruwa), which has been used for treating patients by immersing in herbal oil. Several surgical and medical instruments used at the time have been discovered during excavations at the site. In this place monks of Alahana Parivena rehearsed the code of discipline. The pillars and brick walls suggest that here had been a storeyed building. 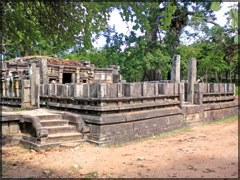 This is the largest of the uposathagharas in the island and according to Mahawamsa was twelve storeyed.